2.2 Sharp Vs. Flat Blades? If you have a garden, you have a shovel. In fact, it’s very likely you have more than one shovel. You might have one with a curved blade and a pointed tip. You may have a narrow one with flat sides, or a gigantic one that’s almost more of a giant spoon-like conveyance device. You probably have two or three handheld ones that you call trowels. You might even have a flat one that isn’t a digging shovel at all. 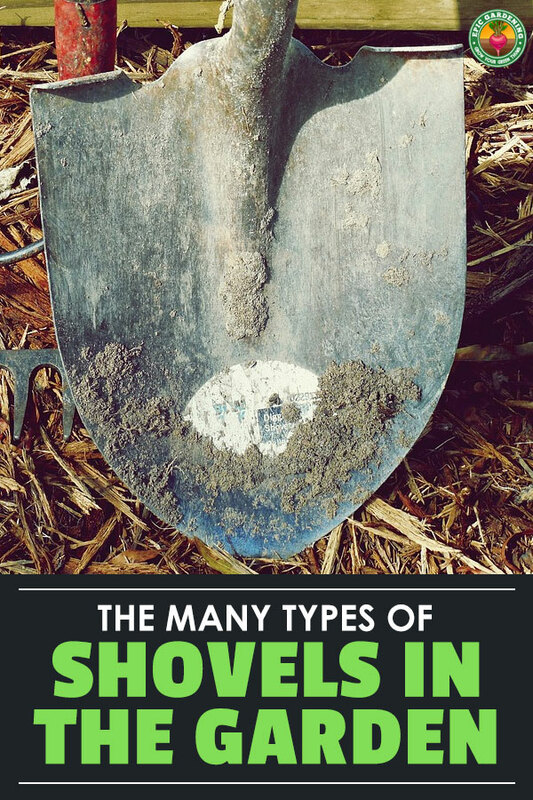 Whether you call it a shovel, a spade, or a scoop, let’s explore the wide category of shovels and their related garden counterparts and go over how they’re used and which are the best. If you just want the best shovels by type, check out the extensive and well-tested list below. Otherwise, read on for a more in-depth look into the wild world of shovels. The primary thing to consider, of course, is what you’re doing. After all, if you’re trying to dig a trench, you should probably use a trenching shovel… shouldn’t you? You could use two basic shovel types (a sharp bladed shovel and a flat bladed shovel) to do almost everything if you really had to. But different styles of blade will greatly simplify your work and lessen the strain of doing different tasks. While this seems obvious (all shovels are used to dig, right? ), it’s not necessarily the case. By digging, I mean actually getting in there and digging a hole or ditch in the ground, not just moving some soil out of the way. And for digging, you need something that’s built for the task. Generally speaking, a digging shovel should have a handle that comes straight up from the center of the blade, not one that’s offset. This helps to add extra leverage when trying to pry up material. Most good digging shovels have a pointed tip to the blade to help cut into the soil, and some fancier varieties even have sawteeth on the cutting edge. Trenching shovels tend to be long and narrow bladed, not much more than 4-6” wide at the maximum. These handheld trenchers are meant for making narrow trenches, hence the name. They’re often used for laying irrigation pipes or making slender swale runoffs. Sometimes they have box sides to help with removing material cleanly without disturbing the trench sides. What all trench tools have in common is a pointed-tip blade, designed to cut neatly into soil, and flat sides to maintain the walls of the trench itself. The goal for trench digging tools is to minimize the disruption of the areas you aren’t digging and to create precise, straight lines. Drain spades look quite similar to trenching shovels. The major difference between a drain spade vs trenching shovel is the slight variation in its shape. A drain spade often has a rounded tip and curved edges, rather than having a pointed tip with flat edges. This enables drain spades to be used for transplanting uses, as well as for clearing out debris from existing drainage trenches or ditches. In fact, they’re used often enough for transplanting that they are sometimes referred to as transplanting spades. Scoop shovels are designed to move material that is already dug out. 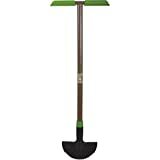 A scoop shovel is also great for moving and spreading mulch, compost, manure, snow, coal, or similar materials. There are both small and large scoop shovels available. While there are lightweight versions made of aluminum that are meant for grain, fluffy compost, etc, a steel scoop shovel is better for heavier items such as gravel or heavier soils. Scrapers have their origin in the use of a flat-bladed shovel to scrape ice off roofs or driveways. However, they’ve developed into their own variation on a shovel. Not meant for digging or scooping, a flat-bladed scraper is ideal for the purpose of getting ice off whatever it’s on. It’s also very popularly used to remove shingles from roofs, as the flat blade easily slides beneath existing shingles. 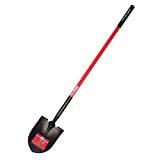 Like scrapers, the landscaping edging shovel has its origins in a classic flat-bladed shovel. In this case, the goal was to cut through plant material and roots to create a nice, neat and flat edge along lawns or garden beds. Most edging shovels are now custom-designed to the purpose, with a shape not unlike the half-circle of a pizza cutter. They work wonderfully to separate plants that form offshoots, and are perfectly designed to make a straight edge. But these shovels are not meant to dig, as the blades are not designed to lift or move soil. I guess it could be said that these, along with scrapers, are truly on the outer edge of the shovel category! The name of these is somewhat misleading, as it implies that these are a digging shovel. In reality, these are meant to be used to excavate a very specific size of hole in already-loosened ground. In essence, you’re using two shovels almost like joined chopsticks to pick up soil from a narrow, deep hole. Push these into tilled or loosened soil, pull the handles apart, and then lift up a perfect bite while leaving a neat hole behind. Every gardener has these around. Some are plastic, others are metal. Some trowels are marked with depth indicators for planting and a pointed tip for easy penetration of harder soil. Others are more scoop-like, with a blunt, rounded tip that makes removing soil from a planting site or transporting planting mix to a planting site easy. In fact, most gardener has two or three variations of these in their garage or tool chest, just because they’re so widely used – they are probably the most common hand tool in a gardener’s arsenal. There’s shovels that are pointy, there’s ones that are flat. There’s handles of fiberglass and wood and sometimes other things. There’s some that are lightweight and some that are heavy. What do you need most? Let’s figure that out. In modern language, the terms are often used interchangeably, but there is a history to the terms “shovel” and “spade”. Traditionally, a shovel is meant for digging, and it typically has a sharply-tipped curved blade and more of an angular blade shape that cuts easily into the soil. 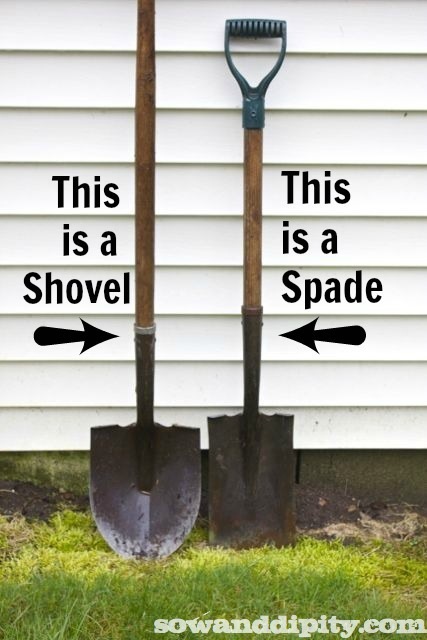 A spade is meant for moving soil, and typically has a flat blade. It can be used for digging, but tends to be less efficient at it unless one is trying to create a straight line, like trenching. However, a flat head shovel or spade is fantastic for removing sod, and definitely is far superior for moving large quantities of material than its pointy-tipped counterparts. In the old debate between sharp vs flat, neither side “wins”, as both have their uses. I keep both types in my garage and use them as the task dictates. But I find myself going back to the old standards more often than not: a pointed-tipped blade for digging, and a flat-tipped blade for moving soil. In considering what shovel you want, you have to consider its handle, because that’s what you’re going to be holding onto. For most digging shovels, you have two options: a standard-length shovel handle, or a D-ring handle which is shorter in handle length but has a D-shaped grip at the end. Your choice is going to depend mostly on how and where you’re using it. Longer shovels can easily reach deeper into the soil, so if you’re digging a deep hole to plant a tree in, this may be your best bet. A shorter shovel is more comfortable to hold, but doesn’t have as much leverage when trying to pry up rocks or roots that might be in your way. I personally use D-ring shovels for most of my garden work as they’re more comfortable to hold onto for long periods of time and suit my purposes more often than standard shovels do. But if you’re likely to be prying up rocks or roots, or doing anything that goes more than 1-1.5 feet beneath the soil’s surface, you will need something a bit longer. You also need to consider the material which your handle is made from. A good hardwood handle is the old standard, but wood has a few issues. It can splinter with age, which makes your shovel nearly useless without hurting your hands. It also can form weaker points in the wood as the wood ages, and it can break more easily. It tends to be heavier than more modern handle materials as well. Fiberglass is popular right now. It does not splinter, nor does it age and develop weak spots. It’s also stronger than most wood and able to resist bending more easily. However, its major drawback is that while wood handles are easy to replace, fiberglass ones are not. If your fiberglass handle snaps, you may need to purchase a new tool. For certain types of shovels, especially scoop shovels, aluminum or steel is a handle option. However, aluminum can bend easily, so it’s meant for lightweight materials only. Steel can be quite heavy, and over time the extra weight of the metal combined with what you’re moving may prove to wear you out faster. The vast majority of shovels on the market have steel blades, with two exceptions. Scoop shovels come in multiple types of material based on their intended use. I’ve seen plastic scoops (which I never recommend as plastic becomes brittle with age), polyurethane scoops (far better than plastic for light to medium weight materials), aluminum scoops (used primarily for lightweight materials), and steel scoops (which can handle anything). 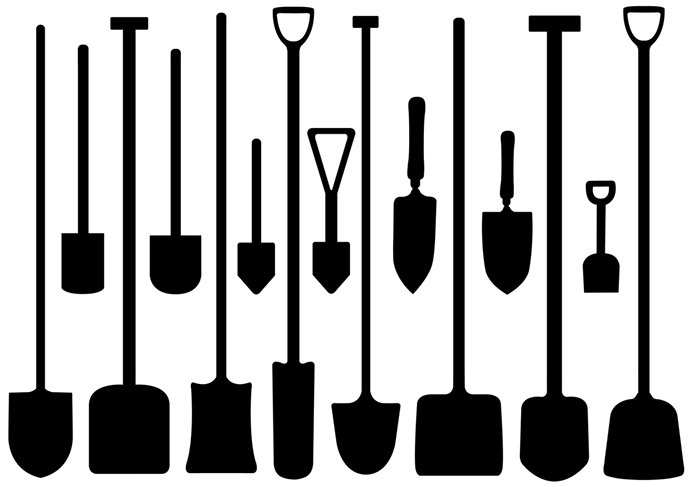 Trowels and soil scoops also come in multiple types: plastic, aluminum, and steel are common. Trowels are sometimes available in carbon fiber polyurethane versions now too, and those claim significant strength, but I haven’t seen any viable strength comparison tests between carbon fiber and metal blades. I never recommend the plastic trowels either, as they just don’t last very long, although they do have a purpose if you’re just working in well-aerated, light and fluffy soil. Aluminum ones are inexpensive, but tend to bend at the tip far too easily. Steel or carbon fiber are likely your best choice. You want your shovel to be durable and able to hold up to its intended job. So it’s important to take the durability of your shovel’s construction into consideration. Is the blade designed in such a way that it will not bend when pressure is exerted on it? Is it attached to the handle in a way that won’t encourage the handle to snap? Typically, the weak points in most shovels are the handle itself, the joint where the handle attaches to the shovel, and the blade (both in the step plate and the blade’s tip). Ideally, you want a shovel that will not bend at the tip or on the step, will remain sharp if it’s a sharp-edged tool, which is firmly secured to its handle in a way that won’t fail, and which has a handle that can take levering force without damage. If it’s a specialty blade like an edging shovel or scraper, you want it to hold its edge all the way along the curved or flat surface and maintain its shape without twisting or bending. And if it’s a trowel, you want one that’s sturdy enough to avoid the dreaded tip-bend that destroys most hand trowels. Often, people do not take the weight of their tools into consideration when they’re buying them – and that’s an error in judgment. If you’re going to be using a shovel for hours and hours to remove sod or dig up large parts of your yard, you want something that will minimize muscle strain. Too heavy of a shovel may not be ideal for most people, although a heavy-duty shovel may be the best choice for a professional who does it every day. So consider the weight of your tools carefully when selecting them. Now that we know quite a bit about the types of shovel, let me offer you my best recommendations as to what you should consider. I’m going to break this down into two sections: best in category, and best specific purpose. One of the best things about the Bully Tools 14-Gauge Round Point Shovel is that the step across the back of the shovel blade spans the entire width of the blade. This means that you can use your legs to do the hard part of getting the shovel into the soil, and use your arms for the actual leverage and lifting. 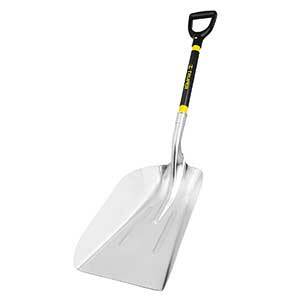 A fiberglass handle gives it durability, and that, when paired with its phenomenal blade design, makes this the top rated digging shovel on our list. If you want something that’s a professional-grade tool, our high-end choice, the Corona All-Steel Round Point Shovel, is ideal. This thing is built super-strong and will last for generations. It is a lot heavier than the Bully as even the handle is made of steel, so that needs to be taken into consideration. It’s also pricier than the Bully. But if you want something that your grandchildren can use as if it were brand new (provided, of course, that you maintain it), this is the one. For most tasks, you don’t need a box-trenching shovel — you just need a shovel with a narrow blade that can perfectly tear out that narrow strip of soil. 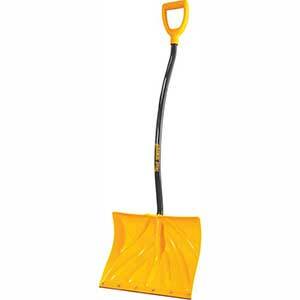 And for that, the Corona Trench Shovel, 4” is our top choice. It’s sturdy, extremely well priced for what you get, and performs the task admirably. The V-shaped blade helps to hold reasonable-sized scoops of soil, and its flat sides ensure that the walls of your trench stay neat. But what if you’re doing a really deep trench and want something that will hold more soil per scoop? Then the box trencher you’ll want is the Bully Tools 14-Gauge 4” Box-Style Trench Shovel. Tall walls on the flat sides provide extra capacity to pull soil out of the ground, and its design ensures a smooth trench wall will stay smooth as intended. There’s a lot of variations on the market, but I would put my money towards the Fiskars 46″ Steel D-Handle Transplanting Spade. This is a powerful tool for transplanting, separating roots, and just general trench maintenance. It has a comfortable D-ring handle which is extra-wide to allow you a two-handed grip when it’s needed, and its all-steel construction can’t be beat. Pro-tip: because it’s black, don’t leave it in full sun while taking a break, because you will come back to a very hot shovel! But despite the poor color choice (which is in-line with Fiskars’ brand style), this is easily the best reasonably-priced drain spade on the market. I can’t discuss scoops without offering good choices for multiple varieties of blade material, simply because each one has its pros and cons. So let’s go through my picks. The molded polyurethane blade of the Ames D-Handle Poly Scoop can easily handle most light to medium-weight material. It’s perfect for shoveling grass clippings, leaves, mulches, composts, grain, or manure. While it does have a wooden handle, the weight of the wood provides a comfortable heft to the tool. This might have some trouble with super-wet snow or soil, and isn’t advised for heavy rock, but for most other purposes it fits the bill. Surprisingly lightweight at under 3.5 pounds, the Truper Tru Pro Aluminum Scoop is my pick for an aluminum scoop shovel. While it is a bit shorter than some of its counterparts on the market, the balance on this tool is surprisingly good, and it’s comfortable to use. The aluminum will handle everything up through snow and gravel/smaller rock, but larger rocks may end up denting the blade with use. Looking for that professional-grade heirloom tool again? Consider the Nupla Power Steel Western Scoop. This steel-headed scoop features a fiberglass handle that has been coated with polyurethane for extra strength and protection. It’s weighty, coming in over 7 pounds, but it will handle all materials with ease. A scraper needs to hold up to what it’s designed for, and the Bully Tools Heavy Duty Scraper does precisely that. All-steel construction with an 11-gauge steel blade ensures that this scraper will last and last. It’s American-made, and comes with a limited lifetime warranty. But you likely won’t need the warranty for this commercial-grade tool! The name Garden Weasel always makes me smile. That might be because so far, there are very few of their tools that have failed me. The Garden Weasel Edge Chopper is no different. The wide foot plate ensures that you can do the force work with your foot, and only need to use your arms to pull it back up. The angled blade easily drills down through most soil types, providing a neat, flat edge. All in all, this weasel is perfect for your garden. But what if you have really tenacious roots under the surface of your soil? Then you need something with a few more teeth than the weasel can provide. If that’s your situation, pick up the Ames Steel Handled Edger. The serrated lower edge of the blade easily chews right through a root mass to create a smooth, even edge. It is sturdy and holds up even to commercial-grade work. If you’re redoing your backyard fence or preparing a hole for a concrete support, you will truly want the Seymour Structron Hercules Post Hole Digger. This digger provides up to a 6.25” jaw spread, enabling you to easily excavate a deep hole for your inset project. Made in the USA, its fiberglass handles are reinforced with a fiberglass core and will handle all the pressure you need to exert on them. It’s weighty at over ten pounds, but that’s not a bad thing since you want those blades to bite a neat hole out of the ground. When I select a trowel, I want one that will hold up to the rigors of everything – and I’ve bent quite a few trowel heads. That’s why the steel construction of the Wilcox Garden Trowel is so important. 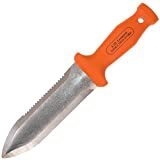 Incised with 6 inch-markers on the blade to help you gauge your planting depth, it is designed with an all-steel construction and has a comfortable grip. All in all, this stainless steel trowel is unlikely to bend or break under pressure. But what if you want something that cuts and digs at the same time? Well, you’re in luck. While it’s not what most people envision as a trowel, the A.M. Leonard Stainless Steel Soil Knife digs and cuts. It’s designed to easily eradicate any roots in its path and to loosen even the most stubborn of soils. People swear by the utility of this tool, and so I have to give it an honorable mention in this category simply because of the utility it provides. 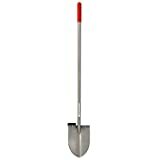 There’s a reason why the Bully Tools 14-Gauge Round Point Shovel is at the top of both this specific-purpose category and the digging category — overall, you can’t find a better tool for the home gardener, and you might be pressed to find one that’s better for professionals too. The combination of its lighter weight and durability makes it stand out and shine over all others. The biggest snowfall of the season has hit, and you’ve got four feet of snow outside and no snow blower. What do you reach for? 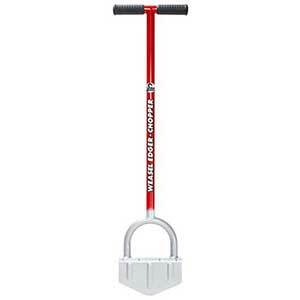 The True Temper 18″ Snow Shovel. While I know I’ve been hard on poly blades in this article, this one goes a step further and attaches a steel edge to the front of the blade, providing extra rigidity and a sharp edge that cuts right through the snow. And if you need to lift and toss a load of snow off your walkway or driveway, the poly’s lightness is really helpful. It has an ergonomic curved handle that offers a little extra leverage. All in all, this is the tool to clear your winter walkways. I generally don’t like tools that I consider to be gimmicky, and a lot of extendable shovels fall into that range. But in this case, I’ll make an exception. Most of the time, what you’ll need for your car is something that can shovel snow, salt, or gravel to help you extricate your car from a winter wonderland or a muddy mess. And the Kylin Sport Utility Snow Shovel is an excellent portable option. It is height-adjustable, and disassembles into three pieces for compact storage in your trunk. Constructed of aluminum, it’s lightweight yet sturdy. If there is one complaint I have, it’s that the blade is a little narrow for my preference, but that’s to be expected in something that breaks down to a small space for storage. That’s the breakdown of pretty much every shovel you’d ever need to buy. Sure, there are a few exotic types of shovel out there that we haven’t covered here, but if you’ve got a couple of these, you’re likely not going to need anything else. Do you have any personal favorites, or maybe a use for one of these shovels that I haven’t covered? Comment and let me know! I was searching round point shovels and after reading what I thought was your personal choice for use I figured I see it. Did you not mean that you use a D-Handle round point? I read all about the Bully which I was already familiar with but still like to see other views. But i did so thinking I would then see the D-Handle round point. That’s about the 2nd most popular shovel… Anyway you didn’t even have a review. I went back and looked closer at your ‘shadowed’ shovel figures and saw there wasn’t one pictured.